You’ve worked hard to achieve your goals. Let’s celebrate! We’ve created this website in honor of our 2018/2019 academic year graduates. Here, you’ll find messages from our speakers, a list of graduating student award winners, graduate profiles, and a virtual degree presentation. 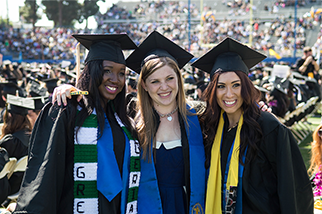 Join in the fun and post congratulatory messages to your peers on their graduate profile pages. Instructors, co-workers, family members, and friends are also encouraged to post messages for our graduates and let them know how proud you are of them and share your excitement for their next journey. To top it all off, we are hosting a synchronous online celebration at 5 p.m. Pacific Time on Tuesday, May 21, 2019. Everyone is invited to this special send-off when iSchool Director Sandra Hirsh and our guest speakers will share words of wisdom to mark this great achievement. Don’t forget to use #SJSUiSchool19 for all of your social media shares. And if you are looking for memorabilia, check out our store on Zazzle.